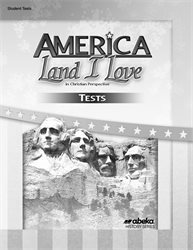 The test book is also correlated with America: Land I Love Quizzes and America: Land I Love in Christian Perspective Teacher Edition, which includes the daily lesson plans. 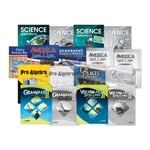 Answers and grading guidance for the test book are sold separately in America: Land I Love Test Key. Gr. 8. Essay questions of multiple parts build the listening and thinking skills that your eighth grader will need for high school. He will be asked to compare and contrast, evaluate philosophies, and explain causes and consequences of historical events. A map location section on nearly every test ensures that your child knows the setting of history, broadening his understanding. Sections that call for him to put historical events in order start building his general timetable of history. Both objective and essay questions encourage your child to interpret historical events from a biblical worldview. A variety of question formats require your child to consider the content from different aspects and hold his attention. Testing every three weeks (for a total of 12 tests) provides vital reinforcement of learning and an opportunity for your evaluation of your child’s comprehension. Two nine-week exams and semester and final exams further reinforce concepts. Since each test clearly specifies the sections covered, adjusting a test to your schedule is easy. Preparing a current events report is easy with the bonus template and instructions provided at the beginning of the test book.